This week’s column looks at some problems involving album art going AWOL on iOS devices, and the iTunes Store app having trouble getting up in the morning with iOS 7. I also answer a couple of iTunes Store questions related to gifting items and copying links to songs. Q: I have a number of album covers that got scrambled in the move to iOS 7; some albums now show the wrong artwork. Any ideas on what happened and how to fix it? Problems with album artwork on iPods and iOS devices are common. Sometimes nothing displays at all; other times the wrong artwork appears. The only solution I’ve ever found to such troubles is a bit radical: Delete all the music on the iOS device and resync the music. To do so, connect the iOS device to iTunes, select it, and click the Music tab in the header bar. Uncheck Sync Music, and then click Sync near the bottom of the iTunes window. After the syncing is complete, recheck Sync Music—iTunes will have remembered your settings, whether to sync all music or just selected items—and then sync again. This can take quite a while, especially if you use iTunes’ feature that converts your music to a lower bit rate when syncing. In that case, you might want to start the sync before you go to bed at night. If you copy music manually to your iOS device, this technique won’t work. Start by displaying the iTunes sidebar: Choose View > Show Sidebar. Then click the disclosure triangle next to the device’s name, and click Music. Choose File > Library > Export Playlist, and save this playlist on your computer. Next, choose File > Library > Import Playlist, and select the playlist you just saved. It will be added to iTunes. Back on your iOS device, select all the music you see when you click Music; then press the Delete key, and iTunes will delete all of the music. Find the playlist you imported, select all of its tracks, and drag them onto the iPhone in the sidebar. iTunes will then copy all the music back, though the operation might take a while if you have a lot of files. Deleting the Cache folder may resolve issues involving incorrectly displayed album art. Another method that sometimes resolves album artwork problems is to delete the iTunes Album Artwork Cache folder. You’ll find this inside your home folder (the one with the house icon). Go to Music > iTunes > Album Artwork. Delete the Cache folder, quit iTunes, and then relaunch it. 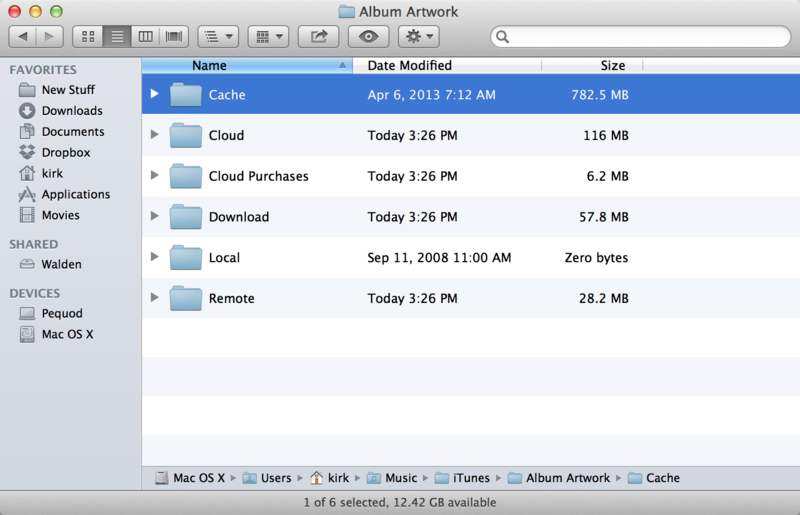 As you display music, iTunes will extract the album artwork from your files and create new items in the cache folder. Q: When I play the Purchased playlist in iTunes so I can listen to music it contains, it also plays the videos in that playlist. Is there a way to prevent it from doing that? The Purchased playlist is a list of items you’ve bought from the iTunes Store. It’s there as a convenience, so you can always find your purchases. But as with a regular playlist, you can delete anything you like from it. I have two solutions to offer. The first is simply to delete all videos from the playlist. Select them and press the Delete key. This will remove them from the Purchased playlist, but not from your iTunes library. The second option, if you want to keep the videos in the playlist, is to uncheck them. You’ll see a little checkbox to the left of each one; just click the box for each of the videos, and iTunes will skip them when you’re playing anything from that playlist. Q: I want to gift my sister a song: How can I do that from my iPhone and the iTunes Store? Unfortunately, you can’t do it from an iPhone or iPad. Your gifting options from an iOS device are limited to albums, though you can gift almost any iTunes item—song, album, movie, or the like—from a Mac or PC. 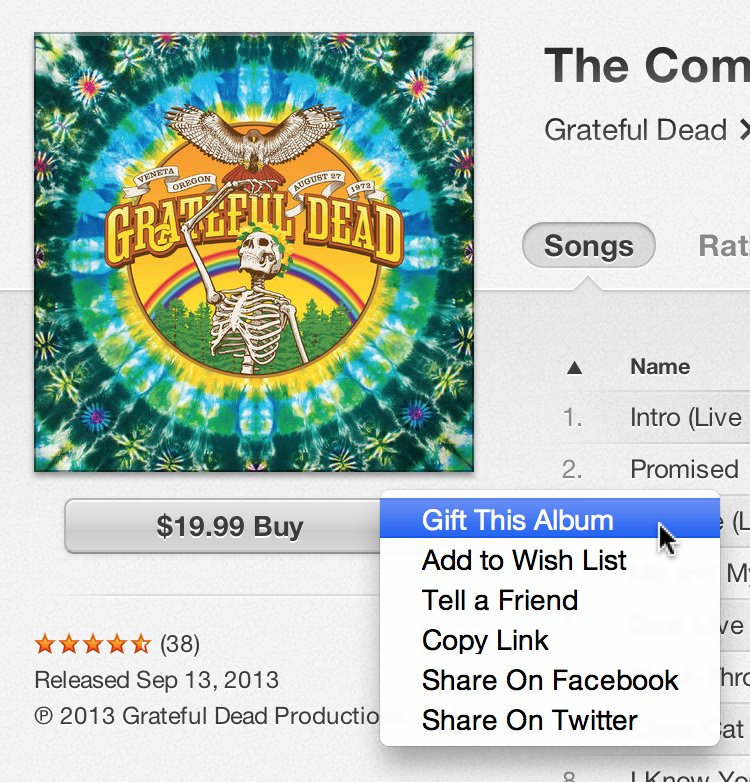 Using an iOS device, you can send an album from the iTunes Store as a gift. On an iOS device, find an album you want to gift, and then tap the Share button. Follow the instructions to send the gift. In iTunes, click the arrow next to the price of any item and choose Gift This Song (or movie, or app, and so on—though not a book). Follow the instructions from that point. Q: I recently updated my iPhone to iOS 7, and the iTunes Store app no longer works. If I launch it, it just quits. How can I get it to start working again? I had the same problem. When I launched the iTunes Store, the screen flashed for a second and then quit. I tried accessing the iTunes Store by tapping the Store button in the Music app, but I got an alert reading ‘Unable to Connect to iTunes Store’. I tried rebooting my iPhone, and that didn’t work either. The solution was to sign out of the iTunes Store and then sign back in. I did so in Settings > iTunes & App Store. After that, the iTunes Store app worked properly. Q: I have several friends in different countries. We all want to have the same song, but there are different versions of the song we want. How do I tell each of my friends how to find the song is so we can have same version? Is there a “part number” or id or something so we know we have the same song? The bit that begins with id identifies the album; the bit after the ? is the song id. Clicking the link will take you to the album on the Web, possibly with the song highlighted (this behavior is inconsistent). But if you click to view that track in iTunes, you’ll just go to the album page in the iTunes Store. (The link will be for whatever country’s store you were browsing when you copied the link.) That should be sufficient for what you need. You can copy a link to any item on the iTunes Store in order to send it to a friend. Alternatively, select the Tell a Friend option in the same pop-up menu. Then enter your friends’ email addresses, and Apple will send them the link.